Ralph Santolla (December 8, 1966 – June 6, 2018) was an Italian-American heavy metal guitarist. He played in many bands, most recently Deicide, but also including Eyewitness, Death (he never recorded any of their albums, but toured with them in 1993 and appeared in "The Philosopher" video), Millenium, Iced Earth, and the Sebastian Bach band. In 2007, he replaced Allen West in Obituary for their album Xecutioner's Return. Santolla was very proud of his Italian heritage and he played guitars by Jackson and Ibanez with the Italian flag painted on them. He most recently played Jackson Guitars, though he had also been associated with ESP Guitars, Dean Guitars and many others. He also used Randall Amplifiers. He was well known for his shred guitar playing style. Born on December 8, 1966, Santolla was a practicing Roman Catholic, which has caused controversy with Deicide fans, many of whom are against Christianity and are aware of frontman Glen Benton's open Satanism. Many were surprised that Benton even let Santolla join the band, due to his frequent criticism of the religion. However, Santolla stated that he was "not going to pretend to be some dark and evil person just so people think I'm metal," and also stated that he respected Benton, despite differences in their religion and beliefs, for not being afraid to be true to himself. In a recent interview on Australian radio, Benton stated that he had no problems working with Santolla because of his religion, saying, "Ralph's what I like to call a part-timer... I mean, his favourite song on the new album is "Death to Jesus". At a 2006 Deicide gig in Laredo, Texas that got out of control, Santolla was arrested for allegedly throwing a Red Bull can at an officer after Deicide was forced to stop playing. Santolla has always avidly proclaimed his innocence and stated that the allegations were wholesale created by the Laredo Police Department. Charges were never filed and in fact the Webb County, Texas, District Attorney has confirmed and certified that the matter will not be prosecuted due to lack of evidence. He had frequently talked about starting his own band with Steve DiGiorgio and Gene Hoglan, both of whom he worked with in Death. Before his death he was working on a new solo instrumental album, titled Requiem for Hope. This is his second solo album, his first was Shaolin Monks in the Temple of Metal. On May 24, 2007, Santolla left Deicide for reason not publicly known, but many believe that numerous death threats involving his religious beliefs, which greatly contradicted that of Deicide frontman Glen Benton. Recently though, Santolla released statements citing that it is more of a business issue than a religious one, as he claims to want to "get as far away from Earache Records as possible when the new album is done." Steve Asheim said in a recent[when?] interview that Santolla left because Deicide was not touring much. 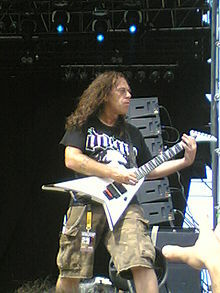 Also in 2007, Santolla was called in to fill the spot on Obituary's newest album Xecutioner's Return and the subsequent Left To Die EP, replacing Allen West after he was incarcerated until 2008. In 2010 he rejoined Deicide. In 2011, he departed Deicide. Santolla was also a guitar instructor around Tampa. His students have included Nocturnus guitarist Mike Davis and Order of Ennead`s John Li. In 2013 Santolla became member of thrash metal band Toxik. On May 31, 2018, it was reported that Santolla had suffered a heart attack and fallen into a coma. He was taken off life support and died on June 6, 2018; he was 51 years old. ^ "DEICIDE Guitarist: 'I'm Not Going To Pretend To Be Some Dark And Angry And Evil Person'". Blabbermouth.net. August 10, 2006. Archived from the original on December 26, 2008. Retrieved 2008-05-17. ^ "DEICIDE Concert In Texas Shut Down By Cops; Guitarist RALPH SANTOLLA Arrested". Blabbermouth.net. July 15, 2006. Archived from the original on December 26, 2008. Retrieved 2008-05-17. ^ "DEICIDE Parts Ways With Guitarist RALPH SANTOLLA". Blabbermouth.net. May 24, 2007. Archived from the original on October 9, 2007. Retrieved 2008-05-17. ^ "TOXIK Taps Former DEATH/OBITUARY Guitarist RALPH SANTOLLA". Blabbermouth.net. 14 August 2013. Retrieved 7 June 2018. ^ "Former DEICIDE And OBITUARY Guitarist RALPH SANTOLLA Is In A Coma After Suffering Heart Attack". Blabbermouth.net. 31 May 2018. Retrieved 7 June 2018. ^ "Ralph Santolla dead at 48!Metal Jacket Magazine". Metaljacketmagazine.com. Retrieved 7 June 2018. ^ Everley, Dave (June 6, 2018). "Former Death/Sebastian Bach guitarist Ralph Santolla to be taken off life support". Metal Hammer Magazine. Retrieved June 6, 2018. ^ "Deicide, Iced Earth Guitarist Ralph Santolla in Coma Following Heart Attack". Revolver. June 5, 2018. Retrieved June 6, 2018. ^ "Former DEICIDE And OBITUARY Guitarist RALPH SANTOLLA Dies At 51". Blabbermouth.net. June 7, 2018. Retrieved June 7, 2018. This page was last edited on 18 April 2019, at 07:23 (UTC).